College is a funny time for many reasons. If you've gone off to school, then you're on your own, probably for the first time in your life. So, you make friends quickly, and those friends you make in the dorms in the first few weeks instantly become incredibly important. Would you be friends with them otherwise? Maybe not, but time and shared circumstance has brought you together, and those relationships can all of a sudden feel very important. 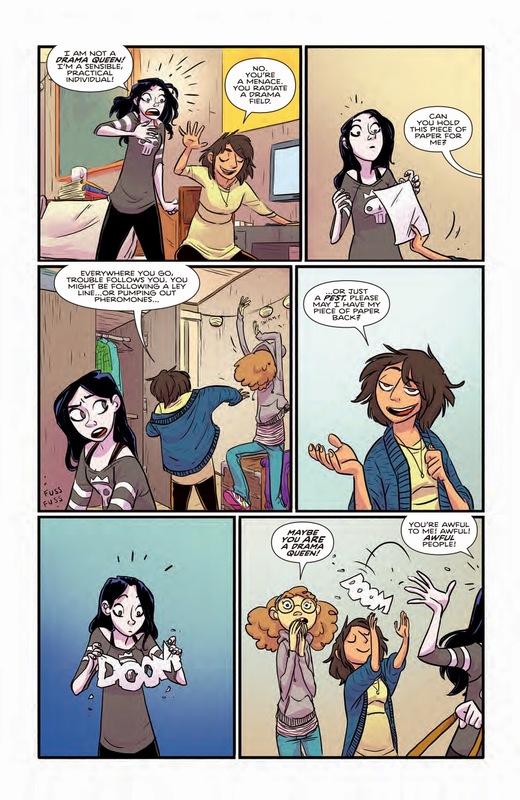 Those fast friendships, along with the small moments of life that can seem huge, are some of the issues explored in the highly entertaining, charming, heartfelt first issue of Giant Days, written by John Allison and illustrated by Lissa Tremain with colors by Whitney Cogar. 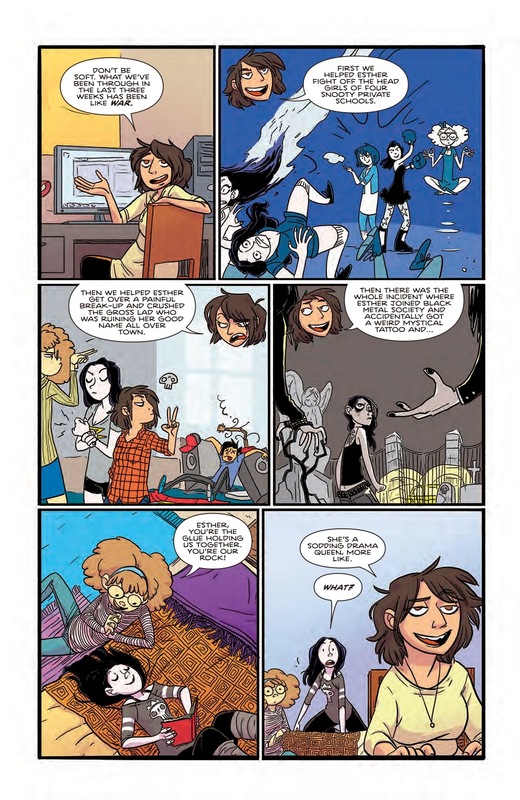 The series is off to a promising start, and for pre-teens on up, Giant Days will be an engaging read. The series centers around three woman newly arrived at University; Daisy (the naive one), Esther (who brings the drama wherever she goes) and Susan (the self-identified "human common sense silo" and the narrator of the story). The first issue illustrates the women as they move through a day at University, and among the many fun moments in this issue, covers a wager between Susan and Esther, that Esther can go 3 days without creating drama. It's not much of a spoiler to say that Esther loses that bet in a spectacularly funny way. The normally unflappable Susan experiences her own drama as she runs into young man from her hometown. His name is McGraw, and the two of them have a history, one that's got them both on edge. This series feels right at home at Boom!, along with books like Lumberjanes and The Woods. 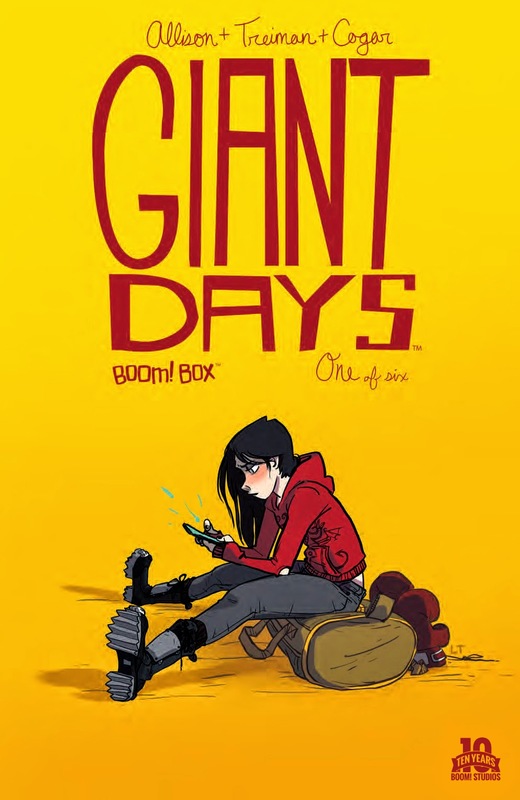 Similarly to those comics, Giant Days is a youth-focused story, about friendship (particularly like Lumberjanes, about female friendship) and weird circumstances. That being said, no one is transported to another dimension or encounters three-eyed Wolves, but there's some interesting elements that may be supernatural in nature, or may just reflect the heightened experiences that people have when they go off to University (when every small moment can feel like the most dramatic thing in the world). Allison and Tremain create some pretty memorable characters within the space of a single issue. They're exaggerated to be sure, but in a story like this, everything is exaggerated (it's a feature, not a bug). The art team also provides humor in some more explicitly "comic" moments, as Esther goes from having angel wings in one panel, to demon wings and horns in the next one, along with the funny and sad use of personal storm clouds in this issue. The lettering (from Jim Campbell) and sound effects are all also nicely used here as well, including the use of jagged lines to indicate frantic motion or surprise, which is effectively done. Susan's the narrator here and the main focus of the story. She sees herself as the sensible one who'll keep her new friends from harm, and makes sense as the reader's point-of-view character. What's great then about the issue is that her sense of equanimity and being in control is completely upended by the appearance of McGraw. Their tension is palpable in a hilarious first meeting, delightfully illustrated by Tremain with dramatic color switches (to emphasize tension) from Cogar. Esther and Daisy are also fun, engaging characters. While we don't know as much about them, they feel like promising characters with interior lives, and there's a great dynamic among the three women. Esther is full of energy and excitement but she doesn't want to be thought of as a "drama queen". Daisy is naive and optimistic, but she's also loyal and has her own secrets and little bits of weirdness. I really appreciated the portrayal of the friendship here. They're fast friends, and they've got each other's backs while still messing with each other in a friendly way, but it's clear that they still really don't know each other all that well. They will presumably get to know each other (and we will get to know them better as well), which should make for some nice surprises over the course of the series. This is solicited as a miniseries, but if there's enough interest, perhaps it'll end up as an ongoing**. It feels like the creative team has a nice handle on these characters and the story they want to tell. If you're looking for a funny, moving, "most-ages" story about friendships, relationships and those giant small moments in our lives, Giant Days is a great place to start. * This is something for which Babs Tarr, current Batgirl artist, should get a lot of praise, as she has raised consciousness about fashion choices in comic book character design. ** Lumberjanes was also initially a miniseries.